Every year, twice per year, downtown Tempe, Arizona is transformed for the Tempe Festival of the Arts. The city streets near Arizona State University in the downtown business district of the City of Tempe are closed to vehicular traffic. Artists begin setting up their tents. People with all kinds of crafts and products do the same. Food and commercial vendors begin laying out their booths. Musicians check out the equipment at the various entertainment areas. Local law enforcement and security plan their strategies for keeping everyone safe and ensuring a pleasant, family environment. It is time for the Tempe Festival of the Arts. When Is the Tempe Festival of the Arts? The Festival is presented each Fall and Spring. The hours are 10 a.m. to 5:30 p.m. Nothing! There's no admission charge. Aside from hundreds of artisans displaying and selling their creations, performers and musicians will entertain at two different stages, and at various street locations around the festival.Expect all genres of music, as well as drummers, dancers and more. It takes place on the streets of downtown Tempe. It is a rain or shine event. If you need a hotel room, the closest nice hotel is Tempe Mission Palms, and you can walk to the event. See reviews of Tempe Mission Palms and make your reservation at TripAdvisor. There are other hotels in Tempe, too. Alternatively, try any hotel on the Light Rail line and you can get to the Festival without having to drive into Downtown Tempe. 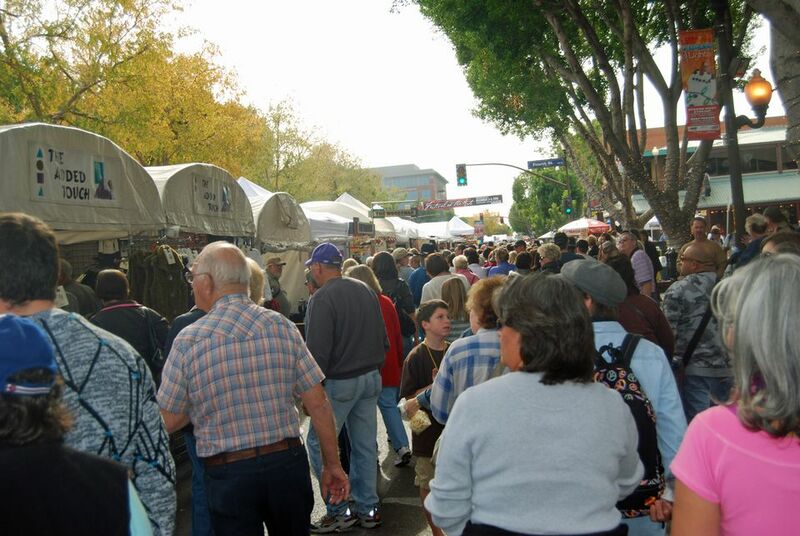 The Tempe Festival of the Arts is one of the oldest and biggest in the Valley. Encompassing nearly five city blocks, the Tempe Festival of the Arts is staged between 3rd Street and University on Mill Avenue. That means that traffic will not flow around the area in the usual fashion. During most weekends, downtown Tempe is a very busy place. During the Festival of the Arts that is exponentially true! While many of the streets along Mill Avenue will be closed to through traffic, more than 5,000 public parking spaces will be available in the Mill Avenue District, along with park-and-ride/METRO Light Rail options offering more than 3,000 additional spaces. Here's a map of Light Rail Stations that indicates which ones are associated with Park-n-Ride lots. Mill Ave. will be closed in both directions between University Dr. and 3rd St.
5th St. will be closed in both directions between Ash Ave. and Myrtle Ave.
7th St. will be closed in both directions at Mill Ave. Local traffic only will be permitted west of Myrtle Ave.
All streets should re-open by 5 a.m. on Monday. Mill Avenue District business parking validations are not accepted on event days. There are more than 15 pay parking lots within walking distance of the Tempe Festival of the Arts. It is consistently one of the largest arts and entertainment festivals in the Southwest, drawing nearly half a million people to the award-winning event each year. Hundreds of artists apply to have a booth at each festival. About half of those are accepted, which means that there are about 400 people displaying their works. Exhibitors may only show hand-made works of art or products, and must represent their own work at the festival. That means that you won't find any mass-produced items here. There are more than 50 traditional and ethnic food booths at the festival. Continuous live entertainment includes classic rock, jazz, pop, blues, big band and Celtic music. There are always activities for kids, typically craft-related. Don't expect rides. Multiple beer and wine gardens. Wear your most comfortable shoes. There's a lot of area to cover! And there's no better place to shop for birthday or holiday gifts (or something for yourself). For more information about the event, visit the Tempe Festival of the Arts online.